Stirrup Jackets. The Gorgeous Horse is your source for custom equestrian jewelry. 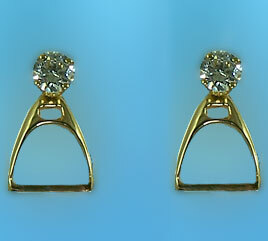 These stirrup earrings are great for everyday wear. They also would make a great gift for anyone in your barn. Dimensions: 1/2 inch tall x 3/8 inches wide. Available in 14kt yellow or white gold or sterling silver. STUDS NOT INCLUDED!! !